The 2018 midterm elections are probably the most highly anticipated midterm elections in modern American history, and the major news networks plan to give that night nearly the same level of coverage that they would give to a presidential election. Normally by now we would have a really good idea what the results will ultimately look like, but this time around we really do not know what will happen on November 6th. There are literally dozens of key races around the country that could go either way, and it is all going to come down to voter enthusiasm. Whoever does the best job of getting their voters to the polls is going to win, and the direction of our country for the next few years could come down to just a handful of voters. Fueled by increased enthusiasm from women, Latinos and young voters for the upcoming midterm election, Democrats hold a 9-point lead among likely voters over Republicans in congressional preference, according to the latest national NBC News/Wall Street Journal poll. You would think with such a big lead that the Democrats would be a lock to take control of the House of Representatives, and earlier in the year that appeared to be the case, but a late surge in Republican enthusiasm has changed the landscape. According to Real Clear Politics, 205 districts are “likely” or “leaning” Democratic, 199 districts are “likely” or “leaning” Republican, and there are 31 “toss up” seats that could go either way. So what that means is that even this late in the game we really do not know who will control the House once the election is over. It could literally come down to a single seat, and so every vote in every district in the nation is going to matter. Even districts that are normally super safe are suddenly in play. Here in Idaho we have two of the safest Republican districts in the entire country, but this time around one of those districts is surprisingly competitive. Normally Republicans win the first congressional district by 20 or 30 points, but the latest poll shows the Democratic challenger within single digits of the Republican. Even though it is not likely, a historic upset is within the realm of possibility. 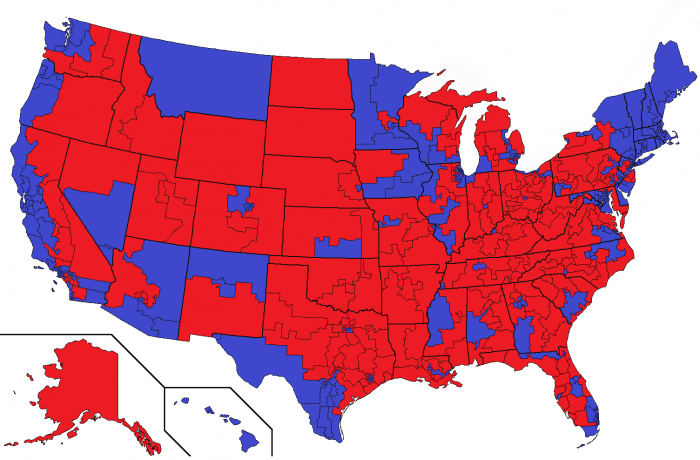 As far as the Senate goes, the map always favored the Republicans this cycle, and most had assumed that the Republicans would maintain control. But that is not a sure thing. According to Real Clear Politics, 4 seats are “leaning” Democratic, 6 seats are a complete “toss up”, and 3 seats are “leaning” Republican. That means that 13 seats are essentially “in play”, and Democrats would need to win 11 of those in order to take control of the Senate. That is tough math for the Democrats, but not any tougher than the electoral math that Donald Trump was facing in November 2016. Yes, it is likely that Republicans will maintain power in the Senate, but it is not a slam dunk. That is why President Trump has been traveling heavily and holding lots of rallies for key Senate candidates in recent days. One key race to watch is in Florida. It has been a back and forth race between Rick Scott and Bill Nelson, and lots of money has been spent by both sides. The latest poll has Nelson with a slim lead, and he will be helped by the fact that it appears that the race for governor may go for the Democrats as well. But Rick Scott is a savvy veteran, and he likely still has some more tricks up his sleeve. The Senate race that has gotten more attention than any other is down in Texas. Beto O’Rourke has raised a massive amount of money and has been tireless in his efforts to try to knock off Ted Cruz, but unless something changes it looks like he is going to fall a few points short. Texas is a red state, and Ted Cruz is one of the most conservative members of the Senate, and the Democrats know that they probably won’t get control of the Senate unless they can somehow knock him off. So endless ads will be running for the next couple of weeks, and the Dems are hoping that they can pull off a miracle. Thankfully, at least the people of Texas have someone good to vote for in that race. But in many races around the country, voters are faced with a choice of voting for either an establishment Republican or an establishment Democrat. In so many primaries around the nation, true conservatives didn’t get out to vote, and so really good candidates went down one after another. This is something that I warned about in my latest book, and it was heartbreaking to watch things play out as they did. So no matter what happens on November 6th, the truth is that fundamental change is not going to happen in Washington this election cycle. But without a doubt, control of Congress hangs in the balance, and the side that can produce a late surge of voter enthusiasm is likely to win. This is your chance to have your voice be heard, and what happens on November 6th will definitely set the tone as we head into the presidential election of 2020.